Calumet, Michigan, circa 1905. "Just up, Hecla Shaft No. 2." Copper miners topside. 8x10 inch dry glass negative, Detroit Publishing Co. View full size. Submitted by Linda Henderson on Wed, 04/04/2012 - 3:46am. The UP is on the south shore of Lake Superior. It is part of Michigan, sometimes to the irritation of its inhabitants, who are known as Yoopers. There have been movements for statehood since the Peninsula became a mining and timber bonanza in the mid 1850's; this was not long after the local Ojibwa showed early explorers where the iron was. I remember tee shirts with "The State of Superior" on them in the 1960's! The Mackinac Bridge connects us with the rest of Michigan. The UP has Lake Michigan to the south and the big lake (Superior) to the north.The peninsula is about 300+ miles long, east and west with smaller peninsulas on both coasts that jut out into their respective Great Lake. The Keweenaw Peninsula, where this photo was taken, is on the Lake Superior side and it is about 100 miles to Copper Harbor on its northern most point from the main Peninsula. US-41 runs from Copper Harbor, Michigan to Miami, Florida. Submitted by Dave on Tue, 10/18/2011 - 8:21pm. Submitted by Brent on Wed, 10/12/2011 - 1:16pm. The Pasty (pronounced with a short "a" like "pass" rather than like "paste") has an interesting history. 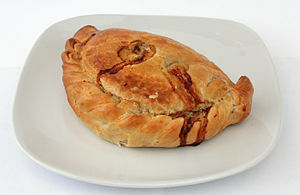 It is the national dish of Cornwall, and a standard in the diet of Cornish miners. The copper country of Michigan's Upper Peninsula had an influx of Cornish miners in the 1860s followed by a small wave of Finnish miners. The Finns adopted the Pasty as their standard meal so that when a larger wave of Finnish migration arrived in the 1890s, they found pastys as the standard dish for their Finnish brethren. Submitted by akld_guy on Tue, 10/11/2011 - 9:12pm. You need to explain what U.P. is to us non-Americans. Submitted by Maddogma on Tue, 10/11/2011 - 1:59pm. Most likely the lunch pails contain some pasties. The pasty remains a very popular U.P. staple, though I'm sure the fellows in the photo enjoyed pasties too. Submitted by Leo on Tue, 10/11/2011 - 12:48pm. Calumet is where the great Notre Dame football star Ron, er, George Gipp was born and is buried. Submitted by salty4568 on Tue, 10/11/2011 - 10:33am. The buckets are similar to the one I carried in the mines and still have. There is a tray that fits into the top of the larger bottom can. The miners carried their lunch (usually a "Pasty" meat pie) in the tray. The bottom held tea. The miners would take several nails and drive them into a timber or lagging board in a ring pattern, put a candle stub in the center, and sit the bucket atop the ring of nails to warm up their tea. I am betting the shift is getting ready to go below, not just coming up .... they are pretty clean. Even hard-rock mines result in dirty miners! Hoist signals were sent by electricity to the hoist room. Great photo! Submitted by DrDetroit on Tue, 10/11/2011 - 9:26am. Would likely be a pasty -- a staple in the U.P. Pasties have a flaky-type pie crust filled with a mixture of ground meat (usually beef) with carrots, potatoes, onion and rutabaga. They were wrapped in newspaper to keep them warm. If you ever visit the U.P. make sure to sample a pasty! Middle row, sixth from bottom, see me after your shift! Submitted by Silv Erchloride on Tue, 10/11/2011 - 8:39am. We got us a wise guy here. Submitted by Trunkles on Tue, 10/11/2011 - 7:17am. Submitted by kalock on Tue, 10/11/2011 - 6:25am. Submitted by SouthHammond63 on Mon, 10/10/2011 - 10:35pm. I keep imagining the feller on the left has a voice like Walter Brennan. "Aww, get on with it an' take the pitcher already! We got work ta do here ya know!" Submitted by Horace T. Water on Mon, 10/10/2011 - 8:58pm. I'll bet every one of those lunch pails has a Cornish Pasty in it. Submitted by Joe Z on Mon, 10/10/2011 - 8:43pm. On July 23rd, 1913 the miners at the Calumet and Hecla Mining Co. went on strike. On Christmas Eve of that year the striking miners and their families gathered on the second floor of the Italian Hall in Calumet to attend a party sponsored by the Ladies' Auxiliary of the Western Federation of Mineworkers. Somebody yelled "Fire!" In the ensuing panic, seventy-three people died, including fifty-nine children. There was no fire. They never found out who yelled "fire" but it was commonly believed that it was an anti-union provocateur who wanted to disrupt the party. The strike was not settled until April 1914. Submitted by akld_guy on Mon, 10/10/2011 - 7:24pm. What are they carrying in their cans or buckets? Is this an authorized lunch container or some device related to their work? Submitted by A Californian on Mon, 10/10/2011 - 6:24pm. It would be really difficult for family members coming down to the mine exit to find the correct husband, father or brother to pick up since nearly everyone there has such similar facial hair, clothing and accessories. Submitted by SynapticCleft on Mon, 10/10/2011 - 5:03pm. It looks like the start/stop point of the Unhappy Log Flume. Submitted by rocketeli on Mon, 10/10/2011 - 2:38pm. Submitted by fanhead on Mon, 10/10/2011 - 2:37pm. "And now there's only one left down there to save." Middle row, third up from the bottom. Submitted by Lost World on Mon, 10/10/2011 - 2:37pm. I'll bet that huge guy in the third row was known as Tiny. Submitted by MEGGAHURTZ on Mon, 10/10/2011 - 2:31pm. The man off to the side looks like Tom Edison and the lever next to him looks like the lever to start an old roller coaster, boy are those guys in for a ride. On a more serious note the miners are wearing oil lamps on their helmets, this picture is pre carbide lamp which was a heck of a lot brighter. Also that appears to be a speaking tube next to the standing gent, probably used to talk to the engine operator who could not see the mine car as it came up. Submitted by jimmylee42 on Mon, 10/10/2011 - 2:18pm. Look at the guy peeking over the hat 2nd row from the top and far right seat. Submitted by Ron on Mon, 10/10/2011 - 1:35pm. never complain about working again and this was the best part of the day! Submitted by Michael L on Mon, 10/10/2011 - 1:14pm. 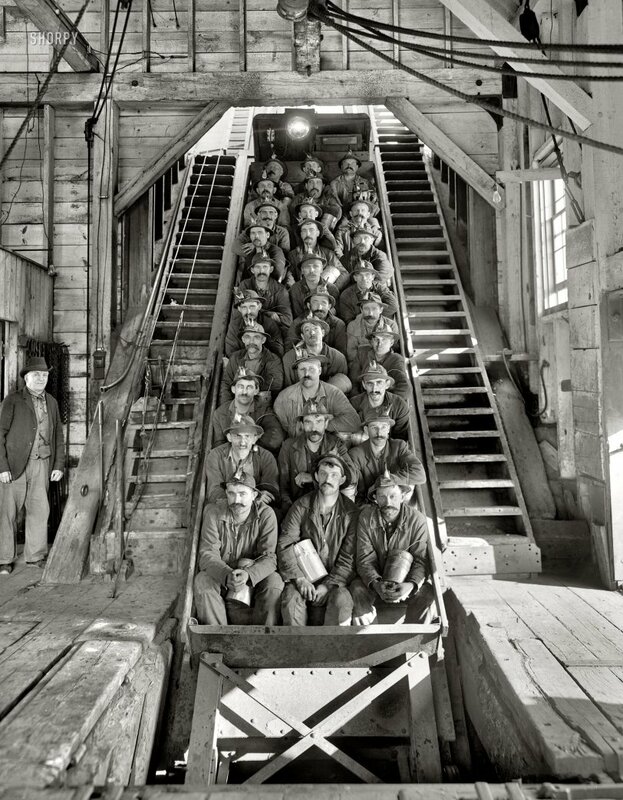 The guy at the right of row 6 seems to be the only one missing the obligatory mine worker mustache. Submitted by OTY on Mon, 10/10/2011 - 12:48pm. This photo brings to mind my two grandfathers, both from Poland around the turn of the century. One became a coal miner in Pennsylvania doing this same kind of hazardous, back-breaking labor and had both legs broken in a mine explosion but did eventually return to work the same job. One worked in a copper foundry in Ct. and died at work on a horrendously torrid July afternoon in 1925. Like these men pictured, they never complained but did what they felt they had to do to support their families and become Americans. Their children met in N.Y.C. and the rest is history, but none of their grandchildren ever had to work as hard as they did. I suspect we are all beneficiaries of our ancestors willingness to give all they had for our better lives. Be thankful for the sacrifices made by your ancestors and give them a grateful thought occasionally. Submitted by willc on Mon, 10/10/2011 - 12:32pm. If these cheerful guys were just coming up from their shift, deep copper mining must have been a lot cleaner than deep coal mining, even if not more safe. Submitted by ZebraMan on Mon, 10/10/2011 - 12:09pm. I love this photo so much that I am going to take the afternoon off work just to look at it. Thank heavens for self-employment! Submitted by Vintagetvs on Mon, 10/10/2011 - 12:05pm. More smiles here than in 90 percent of most old photos. Considering what they do for a living that's rather remarkable! Submitted by Root 66 on Mon, 10/10/2011 - 12:03pm. The guy all the way to the left is saying, "Please keep your hands, feet and arms inside the car until the ride has come to a complete stop. Please exit the ride by using either stairway. Enjoy the rest of your day at Hecla World." Submitted by joeyneutrino on Mon, 10/10/2011 - 11:21am. Shouldn't someone be playing chess? Submitted by rgraham on Mon, 10/10/2011 - 11:10am. That looks like one heck of a steep ride. Even if these guys averaged 150 pounds each, that would be over two tons of meat heading down that hole on every trip.